Mixed pack of Swarovski Flatback Crystals in complementary shades of Pink & AB. Made up of 5 sizes and 6 colours, We have called this mix Molly. Mixed Pack of 400pc Swarovski Flatback Crystals, Non-Hotfix, Mix Of Sizes SS5/SS7/SS9/SS12/SS16. Click here to choose colour. 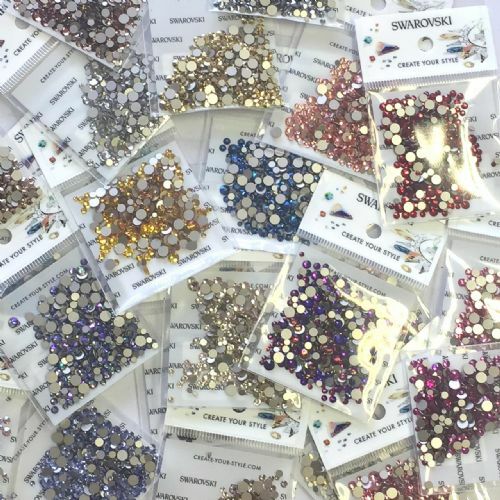 Mixed Pack of 500pc Swarovski Flatback Crystals, Non-Hotfix, Mix Of Sizes SS3/SS5/SS7/SS9/SS12/SS16. Crystal. Mixed Pack of 500pc Swarovski Flatback Crystals, Non-Hotfix, Mix Of Sizes SS3/SS5/SS7/SS9/SS12/SS16. Crystal AB.